The Diana Wortham Theatre in downtown Asheville, North Carolina, announces the schedule for its 2015/2016 Intersections Sing Together Series, held in The Forum at Diana Wortham Theatre. Sing Together celebrates the joy of music and singing in spirited sessions with musicians Beth and Jim Magill. The Sing Together Series is an opportunity for patrons to connect more deeply with music and community. Bring family and friends, make new friends and create community through song. All skill levels are welcome; there is no experience required. The 2015/2016 Sing Together Series kicks off Friday, October 9 with Celebrating the Kingston Trio. For many of a certain era, The Kingston Trio was their introduction to folk music, and their classic sound helped launch the folk revival of the ‘60s. From sea shanties and Appalachian ballads to cowboy songs, calypso and songs from America's early years, their polished and energetic three-part harmonies were unmistakable. This Sing Together will revisit some of the band’s most popular songs. Matching striped shirts optional. Winter Songs – December 11, 2015. Slow down during the busy holiday season with a precious hour of singing. Bring the entire family to learn seasonal songs, enjoy mulled apple cider and cookies, and make snowflakes to take home. Freedom Songs & Spirituals with guest artist Becky Stone – February 12, 2016. Celebrate the inspirational music that brought strength to people on the journey from slavery, to the Underground Railroad, and on through the Civil Rights Movement. Join special guest Becky Stone for a vibrant song-filled exploration of the Freedom Train. Circle & Improvisational Songs with special guest Susan Lachmann – April 22, 2016. Every day is an act of improvisation and creative expression. Join us and special guest Susan Lachmann for an evening of spontaneous vocal inventions in the circle song format. Let’s sing into Spring! All Sing Togethers are on Fridays at 6:30 p.m. in The Forum at Diana Wortham Theatre. The Forum is a large multi-purpose space adjacent to the DWT Main Lobby. Participants are encouraged to buy tickets early for the events by ordering online at www.dwtheatre.com or by calling the Diana Wortham Theatre box office at 828-257-4530. $10 adults/$8 children 12 and under; children 2 and under are free. 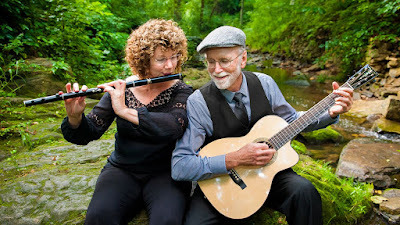 Beth Magill is a professional flute and tin whistle musician, playing mostly Celtic/light classical music, with various musicians & bands, including The Magills & Southwind. She is an active session musician, teaches tin whistle to adults and children, has appeared on numerous recordings and NPR's Mountain Stage, and believing everyone is musical, offers workshops that empower people to be their naturally musical selves. Jim Magill is an award-winning songwriter and instrumentalist on guitar, cittern and mandolin. He is the founding Director of the Swannanoa Gathering Folk Arts Workshops at Warren Wilson College, and in 1994, was awarded the first Fellowship in Songwriting and Composition from the North Carolina Arts Council. To obtain more information on the Diana Wortham Theatre’s Intersections Sing Together Series, call the theatre’s box office at (828) 257-4530 or visit www.dwtheatre.com.